This hot water crust turkey and ham pie recipe tastes delicious and is ideal for the festive season. Discover how to make it. This turkey and ham pie makes a wonderful festive centrepiece. Serve this up for Boxing Day lunch to impress your guests. Serve with a simple salad for an easy meal. What could be nicer than a game pie? The rich meat flavour pairs with the golden buttery pastry to make the perfect comfort food. Game pies have always been popular in Britain. The British game season is in the Autumn and Winter so it is at its best. A hearty pie is a great way to keep the winter chill at bay. Game pies have been around since the Roman times. A mix of pheasant, pigeon and other meats were cooked in pastry. The pastry was discarded, it was only used as a vessel for cooking. During the Tudor and Stuart times royalty would throw elaborate feasts where the game pie was often the centrepiece. The bakers would experiment with fillings, shapes and decorations in order to make the most impressive pie. The feasts were a great celebration and musicians, jugglers and acrobats would entertain the guests. The introduction of turkey to Britain around the time of Henry VIII saw the introduction of the Tudor Christmas pie. This was a rich pie with pigeon, partridge, goose and turkey wrapped in pastry served with hare, wild fowl and other meats on the side. It made an impressive centrepiece and is the basis of the traditional three bird roast still popular today. Game pies were not only eaten by the rich. Country people would catch pigeons and rabbits and make them into pies. Often poaching went on so it was not unheard of to find venison and other game in these pies. During Victorian and Edwardian times game pies became popular in wealthy households. These were times when wealthy households had servants and a professional cook. A game pie is an elaborate and labour intensive dish which shows off the skills of your cook. It also testifies to the luxury of your table. This recipe for turkey and ham pie comes from Wallington Hall. Wallington Hall is country house and estate near Morpeth that belongs to the National Trust. Originally home to the Blacketts, a wealthy Newcastle mine owning family, the house became the family home of the Trevelyan family for many years. It is well worth a visit. There is plenty to see and do. The estate is a lovely place to walk around. There are new discoveries round every corner. The house is full of history and quirky collections. Did I mention they have dragons? Read more: A visit to Wallington Hall. At Christmas Sir Walter Blackett was partial to a Christmas or poultry pie. In the 18th Century his housekeeper was Mary Smith. The recipe comes from a book she published in 1772 with the catchy title “The Complete House-Keeper and Professed Cook Calculated for the Greater Ease and Assistance of Ladies, House-Keepers, Cooks etc, etc.”. A copy of the book is still in the library of Wallington Hall today. It also has the recipe for Christmas mince pies which have minced beef in them. I found the recipe in a National Trust Magazine and gave it a try. I had never made hot water crust pastry before but am really happy with how it turned out. It is a delicious recipe that is perfect for Christmas. How to make hot water crust turkey and ham pie. Hot water crust pastry is something I have never tried to make before. It is the pastry you find on pork pies and it is perfect for making pie cases as it is hard and strong. It is not like any other pastry you have ever made. Hot water crust pastry calls for boiling water and melted fat and loves to be handled. How to make hot water crust pastry. To make hot water crust pastry you need to bring lard and water to the boil in a pan. Pour the boiling mixture into the flour and salt and mix to form a dough. Remember to mix using a food processor or a wooden spoon as the mixture will be very hot. Unlike other pastries it is not a good idea to mix with your fingers! The hot water crust pastry for this turkey and ham pie is slightly different. The water and lard mixture go into the pan with milk. An egg goes into the flour before the hot water, milk and lard mixture get added. This makes for a slightly richer pastry. Once the dough has been made it should be wrapped in cling film and left to chill in the fridge for an hour. This makes it more pliable and easier to work with. The turkey and ham pie contains a mix of diced turkey, minced turkey and diced ham with herbs and spices for flavour. Fresh tarragon, parsley and thyme go wonderfully with the poultry. Black pepper and mace add more flavour. Add the herbs and spices to the food processor with the minced turkey and mix. Chop the ham and turkey into chunks and stir into the mince mixture. Set aside while you roll out the pastry. Traditionally game pies are hand raised. A wooden dolly is placed on the pastry and the pie is made round this. When the dolly is removed the pie base stands on its own. It is much easier to use a tin. Make sure you grease the tin well so it is easy to remove the pie. Top tip: Use a spring loaded tin. The pie is very heavy when done. I struggled to remove it from my push out cake tin. Keep a fifth of the pastry aside for the lid. Roll out the rest into a circle and gently press into the tin, leaving about three centimetres overhanging. 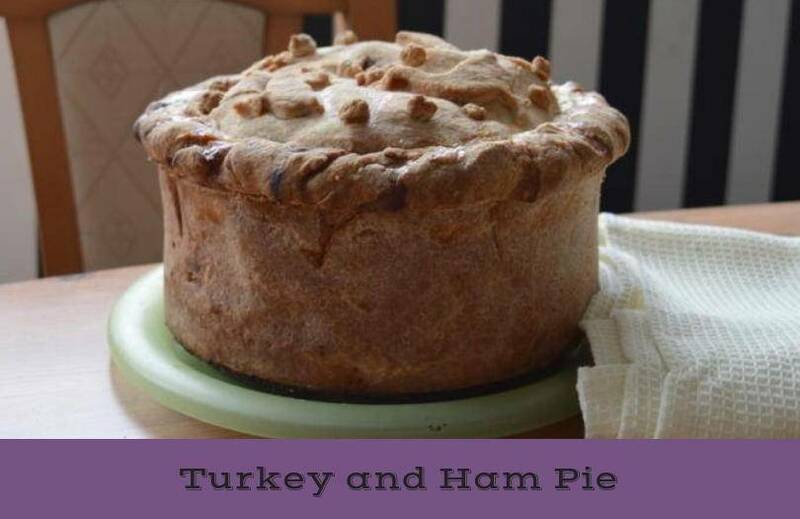 Fill the pie with the turkey and ham mixture. Roll out the pie lid and wet with water. Wet the over hanging edge of the pastry, put the lid on and crimp the pastry together. Use any extra pastry for decoration. All that remains is to cook the pie. The pie will take a while to cook, around two and a half hours. This slow cooking will make sure the flavour develops and the meat cooks through. You can test if it is ready by checking the inside with a thermometer. It should read 80C. Leave the pie to cool for at least an hour in the tin before attempting to turn it out. Turn it out onto the plate you are going to serve it on. The pie is heavy so it will be difficult to move later. Put minced turkey, eggs, suet, herbs and seasoning in food processor. Mix until combined. Remove the minced mixture from the food processor and mix with the diced turkey and ham. Combine the flour, salt, 20g lard and an egg together in the food processor. Turn the food processor to a slow speed. Gradually add the milk mixture to the flour mixture until it mixes together into a dough. When the dough is cool enough to handle remove from the food processor and wrap in cling film. Roll out the pastry into a circle with a diameter of 48cn. Lower gently into the cake tin, pressing in the corners. Press the lid edges into overhanging coller of the pie case folding it inwards. Crip the edge and use any left over pastry to decorate the pie. Brush the pie with the beaten egg yolk and water. Turn the oven down to 150C, 140C fan, Gas Mark 2 and bake for two hours. The centre should register 80C on a thermometer when ready. Leave in tin for at least an hour to cool before trying to remove it. This hot water crust turkey and ham pie is a regional recipe from North East England as it originates from Wallington Hall. It is a recipe that would be found on tables in well to do homes. In contrast most regional recipes from North East England are made to be filling. In the past most of the industries in North East England were to do with mining, building railways or building ships. The labour was hard and food had to sustain the working man. One example is leek pudding. This is a suet pudding full of leeks which is a side dish to a main meal. It is a great way to fill a hungry belly. Another example are canal or bacon floddies which were a common breakfast for people working on the canals. The recipe is still delicious today and would make a great breakfast for Boxing Day. Have you ever made a hot water crust pie? How did it turn out? Let me know below. "Tips to help you make your money go further"